Cannot live without music when in water like swimming or running in harsh weather conditions? Sony NWZW273 Waterproof Walkman Sports MP3 Player allows you to have water splash along with music blast. This music player has excellent cordless one-piece design for use while swimming, playing other water sports or during intense workouts. 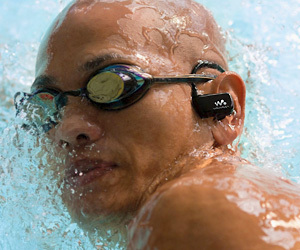 Design keep music player in your ear even while in water or making quick movements during workouts or running in rain. Compact design has 4GB of storage for all the music which you can drag drop from iTunes of Windows Media Player. Besides all the design goodness, it produce good quality sound for musical pleasure all the time.